Disappeared (2012) was the opening novel in Anthony Quinn's "Inspector Celcius Daly Mysteries" series, about a Catholic detective in the PSNI. 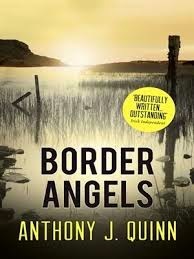 The novel, which is set in counties Tyrone and Armagh, was selected as one of the top ten crime books of 2012 at Kirkus Reviews. Daly is a middle-aged, semi depressive and insomniac detective who investigates unsolved murders that took place during the Troubles. "A charred corpse and a set of footprints in the snow lead Celcius Daly into the twilight world of people trafficking. Inspector Celcius Daly is hunting for a missing woman, Lena Novak, who mysteriously disappeared one winter's night along the Irish border, leaving in her wake the corpses of two men." The Blood Dimmed Tide (2014), was an offbeat historical murder mystery set in County Sligo, featuring WB Yeats as a supernatural investigator. Haunted by the restless spirit of an Irish girl whose body is mysteriously washed ashore in a coffin, Yeats travels back from London to Ireland with his apprentice ghost-catcher Charles Adams to piece together the killer's identity. Quinn grew up on a farm in County Tyrone in Northern Ireland. After studying English at Queen's University Belfast he did a masters in social work, and worked in that field for ten years. His clients included ex-paramilitaries and victims of the conflict. In 2005 he became a journalist with the Tyrone Times and Mid-Ulster Mail. He also used to work as a market gardener. He lives near Dungannon in the foothills of the Sperrins.